Mozilla has launched a test of a new Firefox add-on that recommends sites based on the user's current and past browsing. The add-on, dubbed "Advance," was the latest in the Test Pilot project that Mozilla has run, under that name and others, since 2015. "Test Pilot is a way for you to try out experimental features and let us know what you think," said Nick Nguyen, vice president of Firefox, in a May 2016 blog post. A current list of Test Pilot experiments can be found on this Mozilla site. Advance adds a sidebar on the left of the Firefox window with a two-part recommendation: "Read Next" and "For You." The former highlights websites the technology thinks complement the content of the current tab, while the latter recommends sites/pages based on a user's longer-tail browser history. The idea behind Advance, Mozilla said, was to restore serendipity to browsing rather than treat the activity as strictly utilitarian. "With Advance we're taking you back to our Firefox roots and the experience that started everyone surfing the web," Mozilla contended in a post introducing the add-on. "...That time when the World Wide Web was uncharted territory and we could freely discover new topics and ideas online." Recommendations are generated by Laserlike, a California-based startup founded by a trio of former Google engineers. Billed as an "interest search engine," Laserlike uses the user's browsing history to craft its suggestions. Firefox puts up a permission dialog box prior to the add-on's installation to make sure everyone is aware that data is transmitted from the browser to Laserlike's servers. Not surprisingly - since Mozilla pitches privacy as a key advantage of Firefox - the Advance add-on comes with embedded controls that let the user pause the data collection, download the data sent to Laserlike for examination, or request that said data be deleted from Laserlike's systems. 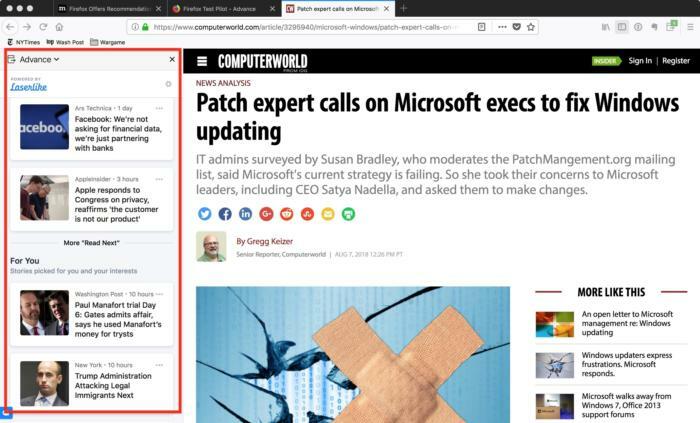 Mozilla also integrated Pocket more tightly with Firefox as of Quantum and uses that page-sharing and read-later service to display recommended stories on the new tab page. In April, Mozilla said it was easing into adding sponsored stories - if not ads per se, then what the magazine business once called "advertorials" - to the Pocket feed. Advance can be downloaded and added to Firefox here. The Advance add-on puts recommended destinations in Firefox's sidebar – enclosed by the red rectangle – based on the current page or the user's browsing history.